For Q4 2017, we've analyzed over 355 million Twitter ad impressions across 100+ unique accounts in USD currency to uncover the average CPM, CPC, and CTR of Twitter ad costs. 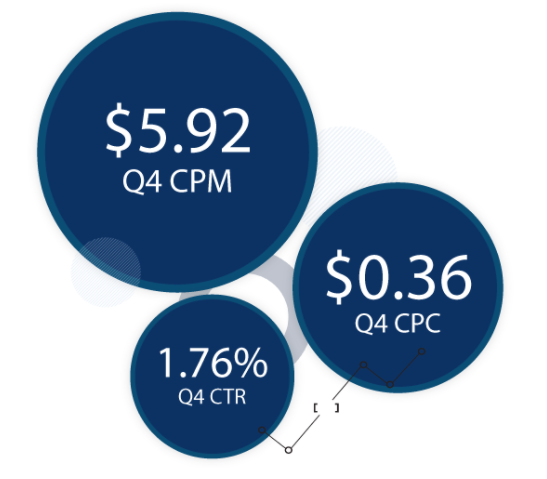 Compared to Q3'17, we found the average CPM for Twitter ads increased 20%, the average CPC for Twitter ads increased 15%, and the average CTR for Twitter ads had no measurable change. Be sure to view the Q1'18 Paid Search and Paid Social ads Benchmark Report for the latest trends. And see our latest Twitter Ad Costs report. Based on AdStage data, Twitter's average CPM increased 20% in Q4 compared to Q3, continuing the upward trend throughout 2017. The 2017 trend shows that Twitter ad CPM increased only 14% from $5.19 to $5.92 comparing Q1 to Q4. Although average CPCs increased by 15% in Q4 compared to Q3, the overall 2017 shows advertisers benefiting from decreasing CPCs. The 2017 trend shows that Twitter Ad CPC decreased 41% from $0.60 to $0.36 comparing Q1 to Q4. Although there was no measurable change for average CTRs from Q3 to Q4, advertisers have benefited from a 90% gain in average CTRs for 2017. The 2017 trend shows that Twitter ad CPM increased 90% from 0.83% to 1.76% comparing Q1 to Q4. Owned-and-operated (O&O) advertising revenue increasing 7% year-over-year, reflecting better-than-expected growth across all major products and geographies. We achieved GAAP profitability for the first time and delivered our highest ever GAAP net income of $91 million with adjusted EBITDA of $308 million. Daily active usage (DAU) grew 12% year-over-year, marking our fifth consecutive quarter of double-digit year-over-year growth. We launched new features to help people discover and talk about what's happening on Twitter, including making it easier to thread Tweets and expanding the character limit to 280 characters for more people around the world. Our mission at AdStage is to help paid marketers quickly and easily #closetheloop on their advertising data so they can understand holistic campaign performance and take action at scale. If you want to learn more about our Twitter Ads reporting and automation solution.